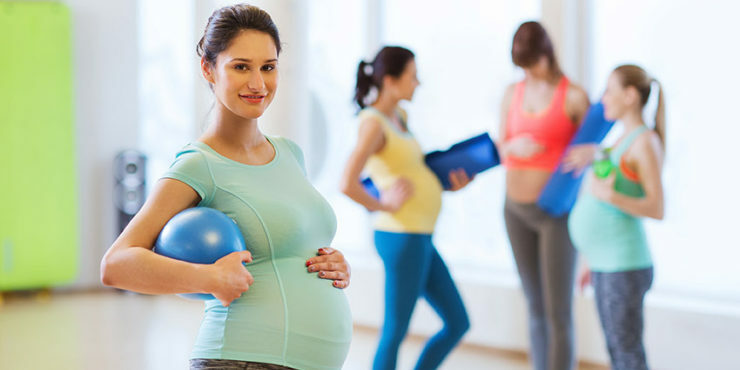 There are many great advantages to maintaining or improving physical fitness in pregnancy, but sometimes it can be hard to know where to start. Your rapidly growing belly can also present some unique challenges that might necessitate adaptations to your pre-pregnancy routine. In combination with frequent activities that improve your cardiovascular fitness — such as power walking, swimming, stationary biking, etc. — the exercises that follow can help decrease your risk for pregnancy complications, improve your overall fitness, minimize common aches and pains, and prepare your body to carry around a child for the next few years. On two to three days per week, you should aim for 2 to 3 sets of 8 to 15 repetitions of each exercise with a 45- to 60-second rest between sets. The only piece of equipment you will need is a resistance band, which you can purchase inexpensively at most sports equipment stores or in the fitness section of a superstore. These are great for building lower body strength and keeping your body strong, as joint laxity increases during pregnancy and in the postpartum period. You can do squats with your legs shoulder-width apart or in a plié position (toes angled outwards), which may be more comfortable as your belly grows. While keeping your chest up, lower down and come back up in a controlled motion (aim for two seconds down and two seconds up). Watch that your knees do not extend further than your toes throughout the exercise. These will help strengthen your arms, in preparation for carrying around your baby and all of that great gear from your registry. Place your hands on the back of a couch or countertop to allow more room for your belly. Keep your hands under your shoulders, and lower your chest toward your hands. Try not to let your hips hike up in the air as you lower and lift. Using a resistance band anchored around a fixed surface (such as a sturdy column or bannister), stand with your body parallel to the band and step away from the tubing until you feel tension. With both hands starting in front of your chest, press the tubing across and away from your body, then back, without rotating your trunk. Turn 180 degrees and repeat on the other side. To make it harder, step further away from the tubing. Lean into a wall with your feet placed slightly in front of you. Keep your upper back against the wall and slowly rock your pelvis forward and upward in a gentle thrust, then rock back until your buttocks are again touching the wall. This motion will help increase range of motion in the hip joints, which will help protect your lower back as your belly grows. Stand with both feet on a resistance band. While holding the band in both hands with palms up and elbows by your side, lift and lower your arms. This is great for building the upper-body strength needed for holding your baby in one arm while trying to multi-task. These are excellent for preparing the lower body for labor. Stand perpendicular to the back of a couch or countertop and use one hand for support. In a staggered leg stance no wider than hip width, maintaining knee-over-toe position and with your back heel lifted off the ground, lower your body toward the floor and back up. It’s important to maintain trunk and core strength as your center of gravity changes. Like push-ups, planks can be done on the floor on your forearms or standing with your arms on the back of a couch or countertop as your belly grows. Line your elbows or hands under your shoulders, keep your head looking down and hold for 15 to 60 seconds. Think of your body forming a line from shoulders to heels with your hips facing the ground the entire time. On a carpet or mat, face the floor on all fours with your hands under shoulders and knees under your hips. While facing down so you don’t put any extra stress on your neck, lift and lower your opposite arm and leg at the same time with a slight pause at the top. Switch sides to complete the set. Try to keep your hips facing the floor at all times. This exercise is great for maintaining flexibility in the lower back area, which can be tighter (and more uncomfortable) as your pregnancy progresses. Remember to talk to your healthcare provider before starting any new exercise regimen. Adequate hydration is extremely important — ideally 8 oz. of water before, during and after working out. And always let your body be your guide: Rest when you need it, and gradually increase your repetitions and intensity. As featured in Well-Being Fitness magazine. Lynsey Caldwell Owen, MD, FACOG, is an obstetrician/gynecologist at Arlington Women’s Center and Virginia Hospital Center in Arlington, VA.
Jill Stump and Caity Davis, owners of FitOne Studio in Alexandria, VA, are nationally certified personal trainers through the American Council on Exercise (ACE) and the National Academy of Sports Medicine (NASM). Fun fitness is only a few steps away! © 2019 FitOne. All rights reserved. Your fitness evolution is only a few steps away!